November 5th. and 6th., and the space is limited. 7 - 3/8ths" x 5.75"
You can make a different painting - a painting and an idea that the world has never seen before. Here are some ways to make it different. Be authentic. 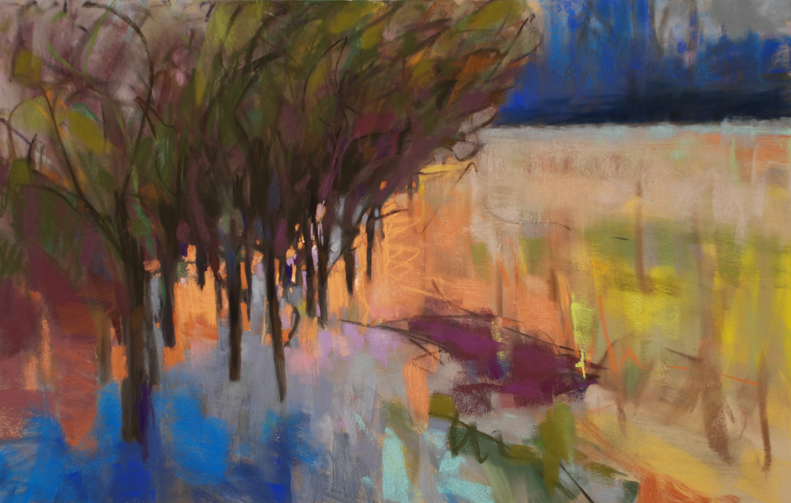 Have a new idea, and think of subjects that evoke a response in your own self. I like to make images of the Hoquiam River that aren't sunny, but that do evoke a feeling of hope and resolve. Work with some amount of personal involvement. That has happened when you have struggled with an image. Perhaps you lost track of the time. Keep your ideas and your shapes big. How do you work to gain authenticity? Next: 101 Blog Post Ideas. You will have no more excuses. There isn't any magic method for working in the colorist style. So, what is there to teach in a workshop setting? Much! Because in your pastel bag, in addition to your supplies, you also carry around a set of conventions. They are your tried and true, "works every time," methods of working on your pictures. I want to press those out of you. 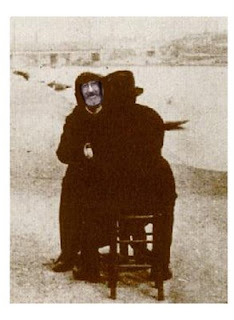 The things you see when you search for painting subjects are ever new and fresh. Can your paintings be new, also? 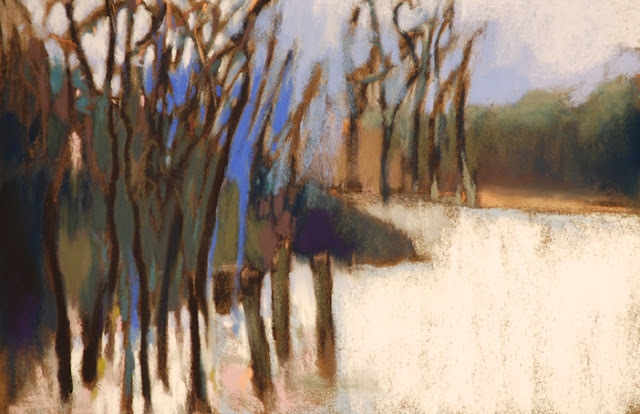 Henri Matisse wrote, "We move towards serenity through the simplification of ideas and form.......Details lessen the purity of lines, they harm the emotional intensity, and we choose to reject them. It is a question of learning - and perhaps relearning the 'handwriting' of lines. The aim of painting is not to reflect history, because this can be found in books. We have a higher conception. Through it, the artist expresses his inner vision." Reference. 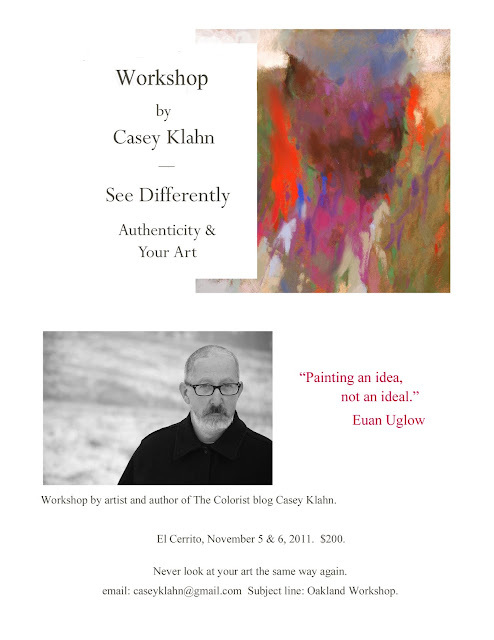 Next Workshop: Oakland (El Cerrito), California. November 5 & 6, 2011. Contact me via e-mail. The following few posts will be my after-action review of the workshop that I held in the Portland area last Spring. The axiom goes that the teacher learns as much, if not more, than the students in the process of teaching. 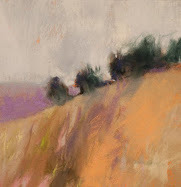 Here is my chance to express what I learned at my own workshop titled "Never See Your Pastels The Same Way Again." 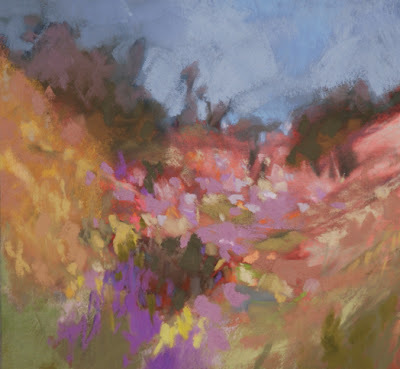 Produce a pastel (painting) that says something new. 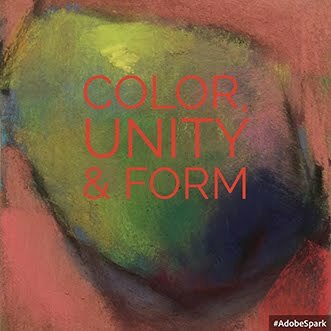 Gain an appreciation for universal elements of art via Modernist and Colorist ideas. Lose something precious; find new strength. 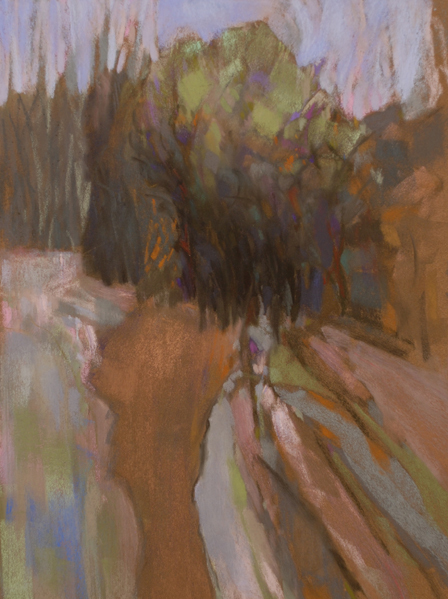 Art workshops can be demanding on the artist-student, and I have attended ones where I have lost sleep at night because of the challenges to integrating new ideas that the instructor introduces. So deep and integrated are our creative ideas and patterns that grafting truly new knowledge onto them is an emotional move. I liked the advice I read from Wolf Kahn about teaching. He said, "make demands" of your students. If you don't bring anything new to the table, why teach at all? Find out what happened in the posts to follow. Photo credit: Katherine van Schoonhoven. 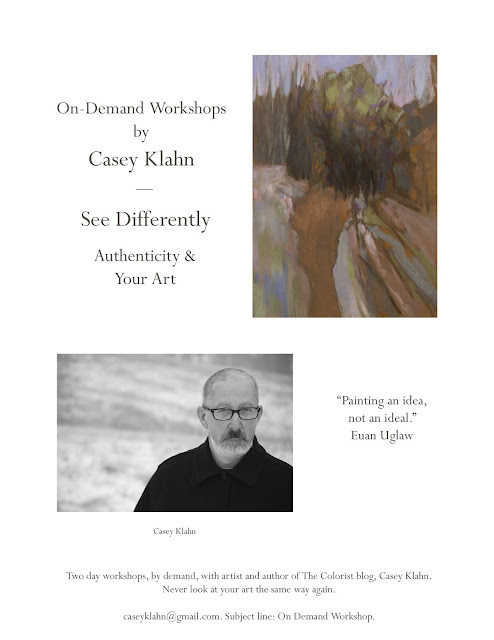 To sign up, e-mail me at caseyklahn (at) gmail.com with the attention line: workshop. John and Joe - StoryCorps 9/11 animation from Rauch Brothers on Vimeo. Sausalito is over and I am back home, now. This was my best year to date, even given the worst economy. 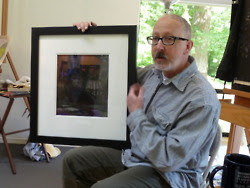 I had to work twice as hard, and "show up to market," which means I had to have the right mix of works to offer. I will be returning to the Bay Area in early November to teach a workshop. More on that soon. One popular event in my booth was a "Flat File Sale." 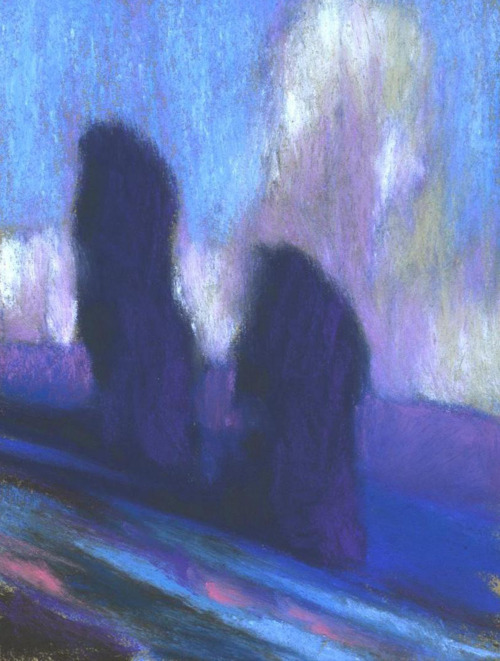 That is, I sold loose and unframed artworks, both pastels and drawings, at set prices and at make-a-bid prices. Would you like to participate in that here at The Colorist? Maybe I can film the file drawers and contents and the bidding can begin. 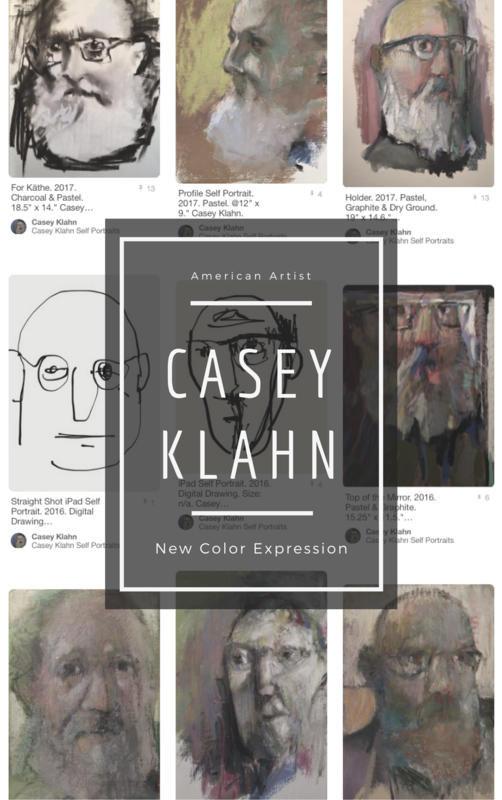 Just an idea for now, but you could own a Casey Klahn for less if you don't mind doing the framing later. Some of the rewards of exhibiting are unexpected and very dear. Hi Casey, my friend and I just got back from the Sausalito show. 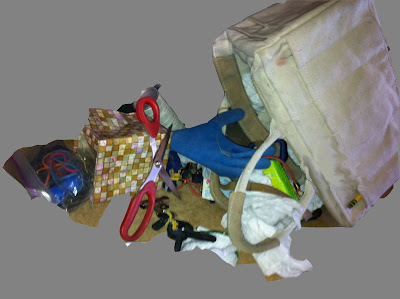 We agreed that your work was some of the most beautiful/interesting/professional work there. I'm so glad I got to see these stunning pastels in person, thanks so much! A City by the Bay. Sausalito. 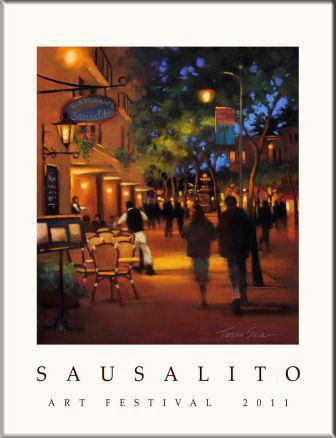 My friend, Seattle artist Teresa Saia, did the artwork for this year's Sausalito Art Festival Commemorative poster. It is the best one I've seen. If you don't happen to get the app., you can find me in Booth 302. The art will be real, not virtual, like here on the blog.